According to Freedom in the 50 States, which we reviewed a couple of days ago, New Jersey is in the bottom 10 and has been moving in the wrong direction. This dismal ranking is not an anomaly. 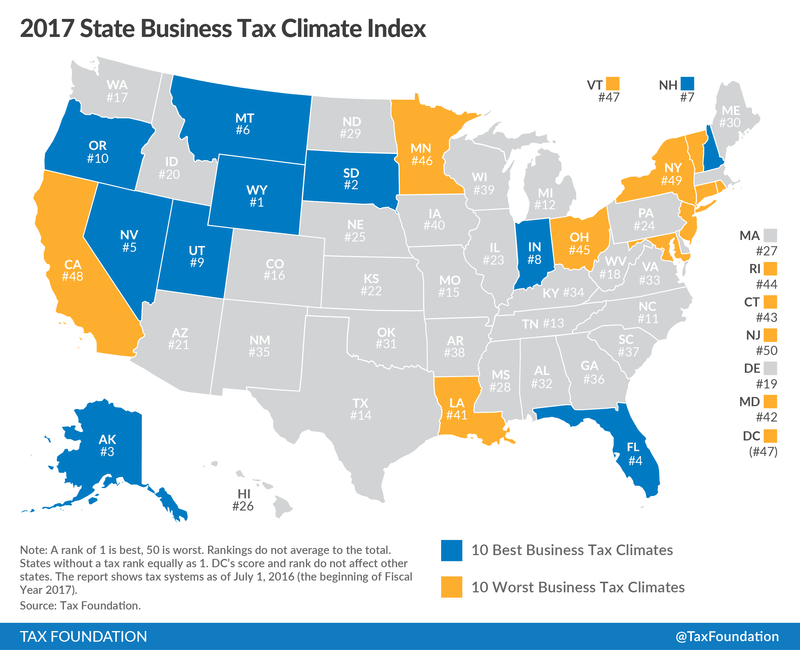 New Jersey also is in the bottom 10 of states according to Economic Freedom of North America, and the Garden State is dead last according the State Business Tax Climate Index and State Fiscal Condition. In a perverse way, I admire New Jersey’s politicians. They’re not satisfied with the state’s low scores. They want to become even less competitive. If that’s even possible. As I noted in the interview, the latest proposal for a “rain tax” isn’t necessarily objectionable if examined in isolation. But in the context of New Jersey’s fiscal deterioration, it’s almost as if politicians are writing another passage in a very long suicide note for the state. Consider what happened recently with the gas tax, as explained by the Wall Street Journal. …a silver lining used to be the Garden State’s relatively low gasoline tax of 14.5 cents a gallon—second lowest in the U.S. No more, and therein lies a tale of why taxing the rich to finance government is an illusion. In October 2016, then-Gov. Chris Christie signed a bill raising the gas tax by 22.6 cents to 37.1 cents a gallon …the bill also included a clause that automatically raises the gas tax if it doesn’t produce the expected revenue each year. This is a self-fulfilling economic prophesy. A higher gas tax causes people to drive less, which in turn has meant that revenues have fallen short of the expected $2 billion target. So on Oct. 1 the gas tax will rise another 4.3 cents to 41.4 cents per gallon, which will be the ninth highest in the U.S. …This will be the state’s third tax increase in four months, following June’s increase in income and corporate tax rates. …The larger lesson is that sooner or later the middle class always gets the bill for bigger government. Higher income and corporate taxes drive the affluent out of the state, which means less revenue. That leaves the middle class to pay in higher sales, property and now gasoline taxes. Needless to say, New Jersey’s taxaholic lawmakers want even more revenue. Here are some excerpts from a report by Politico. Gov. Phil Murphy said Wednesday he may propose new tax increases when he unveils his budget in March, saying he’s worried that the state has not done enough to achieve what he called “tax fairness.” …The governor…had sought some $1.7 billion in new taxes… Murphy was met with fierce resistance from fellow Democrats in the Legislature… Murphy ultimately agreed to…$1.6 billion in annual revenue. …Murphy, speaking at a church in Newark where he delivered a speech on his first-year accomplishments, said he needs to leave his options open as he starts to prepare a budget… “I would say everything is on the table. Period, full stop,” he added when pressed again about the idea of new tax increases. If all this sound worrisome, that’s because it is. But it gets even worse. As I warned at the end of the interview, the 2017 tax law restricts the ability of federal taxpayers to deduct taxes paid to state and local governments. And that means the full burden of those taxes is now much more explicit, which means more and more taxpayers in high tax rates are going to “vote with their feet” and move to states with less onerous fiscal regimes. In other words, New Jersey politicians are making their tax system worse at precisely the moment that the geese with the golden eggs have more incentive to fly away. P.S. Given this grim news, I’m surprised that fewer than 9 percent of people picked New Jersey to be the first state that will suffer fiscal collapse. P.P.S. What’s really remarkable – albeit in a very sad and tragic sense – is that New Jersey in my lifetime used to be like New Hampshire, with no state income tax and no state sales tax. P.P.P.S. 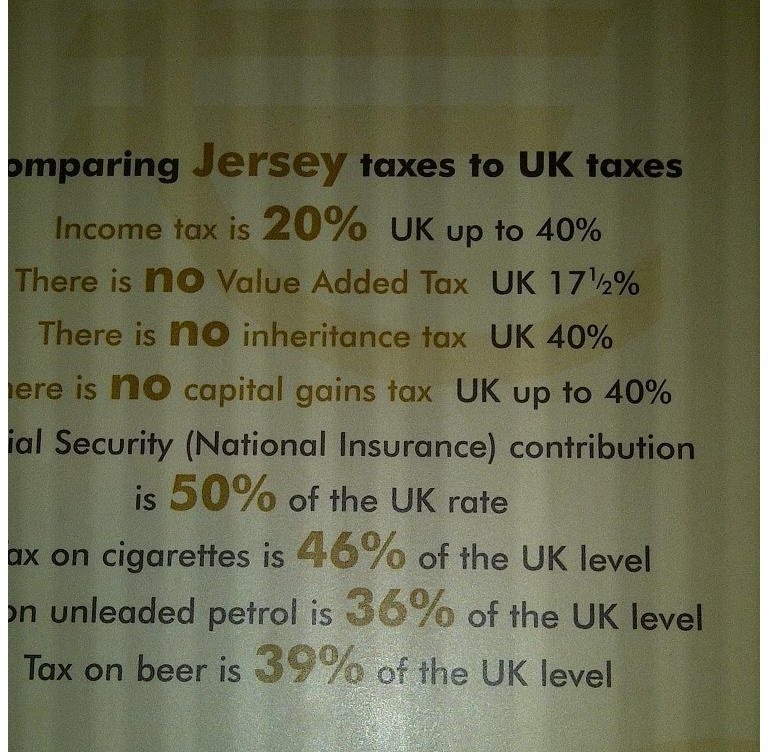 There is a Jersey with good tax policy, but it’s far away from the American version. A couple of decades can make a huge difference in the political and economic life of a jurisdiction. Two decades ago, Venezuela had not yet been subjected to the horror of Hugo Chavez and his destructive statism. Three decades ago, the pro-market success story of Estonia was an enslaved part of the totalitarian Soviet Union. Four decades ago, the Latin superstar of Chile was still in a hangover stage from a disastrous communist government. Five decades ago, Ronald Reagan was a conservative governor of the now-notoriously left-wing state of California. And here’s something especially amazing from a bit more than five decades in the past. New Jersey used to have no state income tax and no state sales tax. Yes, your eyes are not deceiving you. The basket case of New Jersey used to be a mid-Atlantic version of New Hampshire. But once the sales tax was imposed in 1966 and the income tax was imposed in 1976, it’s been all downhill ever since. An article in the City Journal helps to explain the state’s fiscal decay. Brendan Byrne, a Democratic former governor of the Garden State, …told mayors that the state would need a “large revenue package”… The heart of the package would be a new statewide income tax, which went into permanent effect in 1977. Byrne promised that the additional money would help relieve the high property-tax burden on New Jersey’s citizens… Four decades later, the plan has failed. …politicians and special interests don’t see new streams of tax revenue as a means to replace or eliminate an existing stream, but rather as a way of adding to the public coffers. (For those who entertain fantasies of a value-added tax replacing the federal income tax, take heed.) New Jersey’s income tax started with a top rate of about 2.5 percent; it’s now around 9 percent. Needless to say, nothing politicians promised has happened. Property taxes haven’t been reduced. They’ve gone up. The government schools haven’t improved. Instead, the test scores in the state are embarrassing. And debt hasn’t gone down. Red ink instead has skyrocketed. And what’s amazing – and depressing – is that New Jersey politicians continue to make a bad situation worse. Here are some excerpts from a Bloomberg report. New Jersey Governor Phil Murphy proposed taxing online-room booking, ride-sharing, marijuana, e-cigarettes and Internet transactions along with raising taxes on millionaires and retail sales to fund a record $37.4 billion budget that would boost spending on schools, pensions and mass transit. …Murphy, a Democrat…has promised additional spending on underfunded schools and transportation in a credit-battered state with an estimated $8.7 billion structural deficit for the fiscal year that starts July 1. …Murphy said Tuesday in his budget address to lawmakers. “A millionaire’s tax is the right thing to do –- and now is the time to do it.” …The budget…would…restore the state’s sales tax to 7 percent from 6.625 percent… Murphy’s proposal would almost triple the direct state subsidy for New Jersey Transit, which has been plagued by safety and financial issues. More taxes, more spending, followed by even more taxes and more spending. I wonder if Greek taxpayers would want to tell their counterparts in New Jersey how that story ends. Assuming, of course, there are any taxpayers left in the Garden State. There’s already been a big exodus of productive people who are tired of being treated like fatted calves. And don’t forget that New Jersey taxpayers no longer have unlimited ability to deduct their state and local taxes on their federal tax return. So these tax hikes will hurt much more than past increases. In any event, taxpayers better escape before the die. Though I know one guy who won’t be leaving. P.S. Anybody want to guess whether New Jersey collapses before California, Illinois, or Connecticut? They’re all in the process of committing slow-motion suicide. States such as Illinois, California, New York, Connecticut, and New Jersey have very serious structural problems because of high tax burdens and unsustainable spending levels (often associated with excessive pay and benefits for bureaucrats). I frequently write about those big issues, but I also like to periodically share examples of other bone-headed policies at the state level. These are not the types of policies that threaten bankruptcy, but they illustrate why it’s not a good idea to give power to politicians and bureaucrats. A threat of prison time in Indiana for rescuing a baby deer. An armed raid of an okra farm in Georgia. Spending more on bureaucracy than grants in Illinois. Corrupt insider dealing by a law firm in New York. Here are some new examples. We have a column in Forbes about the dangerous plague of unlicensed and unregulated (gasp!) cakes in New Jersey. At first, she sold her baked goods to support her son’s school fundraisers. …Soon Heather started receiving requests from family, friends, sports fundraisers, and even a wedding venue. …With this business, Heather hoped she could pay for her son’s college education and one day open her own brick-and-mortar cake pop shop. Unfortunately, her dreams were dashed thanks to a law that exists only in New Jersey. 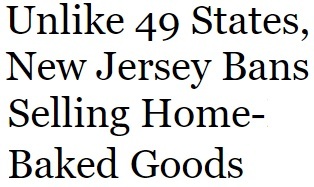 Unlike 49 other states, selling baked goods made at home is illegal in the Garden State. Baking and selling just one cake, cookie or muffin risks fines as high as $1,000. When Heather learned she had to shut down her cake pop sideline, the news was “crushing,” she said. As is so often the case when governments are suppressing liberty, “health and safety” is the excuse. New Jersey’s main justification for the ban is to protect the public’s health and safety—a claim that’s belied by the fact that nearly every other state has a “cottage food” law on the books, which legalizes the sale of homemade cakes, cookies, jams and other food deemed “not potentially hazardous.” …In order to sell cake pops, cookies or other shelf-stable treats in New Jersey, Heather must either build a licensed “retail food establishment” separate from her home kitchen or she can rent a commercial kitchen, which can easily cost $35 an hour. Fortunately, the Institute for Justice is fighting to overturn the law. Heather and two other home bakers joined with the Institute for Justice and filed a lawsuit against the state earlier this month. …A similar IJ lawsuit has already defeated a pastry prohibition in Wisconsin. Over the summer, a Wisconsin judge struck down the state’s ban on selling home-baked goods because there was “no real or substantial connection” between the law and public safety. …In his ruling, Lafayette Circuit Court Judge Duane Jorgenson noted that the ban protected established businesses from greater competition, which is why groups like the Wisconsin Bakers Association heavily backed the law. …Those rulings followed a 2015 IJ court victory on behalf of home bakers in Minnesota, which galvanized the state to expand its cottage food laws. Now the state boasts over 3,000 cottage food producers. Notice, by the way, that protecting an established interest group was the real purpose of the law. In other words, the law was basically similar to schemes for occupational licensing. This next item is so strange that I wonder whether it is somehow fake. But I also suspect it’s too bizarre to be fake. In any event, I wonder about the reason for this government-mandated notice?!? And if you find a (gasp!) vending machine without the notice, what purpose is served by calling the number? 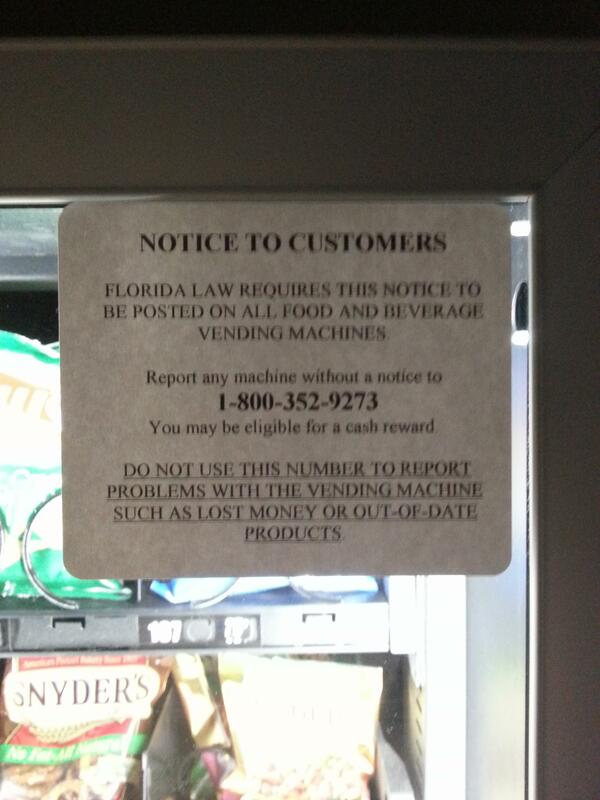 And do the bureaucrats expect people to memorize the number in case they stumble upon a rogue vending machine?!? Oh, and how long before some people figure out how to remove the notice and then call the government in hopes of getting the “cash reward”? If anybody knows the answer to any of these questions, feel free to share your thoughts. In the meantime, I’ll simply assume that the notice presumably isn’t as pointless and stupid at this pedestrian sign and definitely not as creepy and malevolent as this “public service” notice. Next, we have a story from ABC News about taxpayer-funded generosity to pets in Michigan. A dog in western Michigan has been approved for unemployment benefits — and he’d be bringing in a cool $360 a week. Michael Haddock, of Saugatuck, Michigan, says he received a letter on Saturday from the State of Michigan Unemployment Insurance Agency (UIA) addressed to Michael Ryder, according to Grand Rapids ABC affiliate WZZM. Michael is his name. Ryder is his dog’s name. …Haddock says the employer listed on the letter was a restaurant chain in Metro Detroit. After receiving the letter, Haddock contacted the restaurant chain and the state unemployment office. …The Michigan UIA announced Tuesday it was creating a special investigative unit to handle the recent increase in fake unemployment claims. The agency attributes many of the claims to recent data breaches. Haddock isn’t sure how scammers got his dog’s name. I’m clearly behind the times. I have some cats that need to sign up for handouts! On a more serious note, I confess that I’m not aware of the degree to which unemployment benefits are fraudulent. Hopefully it’s not as bad as the EITC, though I’m confident that problem is bigger than politicians and bureaucrats would ever admit. And why would folks in the government even care? After all, it’s our money they’re squandering rather than their own. And Milton Friedman educated us on what that means. From the perspective of good public policy, though, the real problem with such benefits (as personalized here and here) is that they lure people into extended periods of joblessness.